Traits/Powers/Abilities: The Mayapan all possess certain superhuman physical attributes. They are apparently immortal and cease to age at some point. Each Mayapan also possess additional superhuman powers. For instance, Ixchel can command the elements of the storm (wind, rain, thunder, lightning, etc.). Mayapan are telepathic, and use "godtalk" when speaking, so they can be understood without language barriers. They built high-tech "impenetrable hyperactive megadevice" pyramids over areas that focused "currents of the Lifewave." Using jade-based technology, they could collect and store "Life Force" and teleport the pyramids or objects in the pyramids' immediate vicinity to predetermined points of "Lifewave" concentration in Canada, Egypt, South America, and Greenland. For unrevealed reasons, Mayapan inside a working jade-technology pyramid are restricted to human form; conversely, the pyramids seem to be inert stone and crystal when Mayapan are not present, but become fully active in their presence. 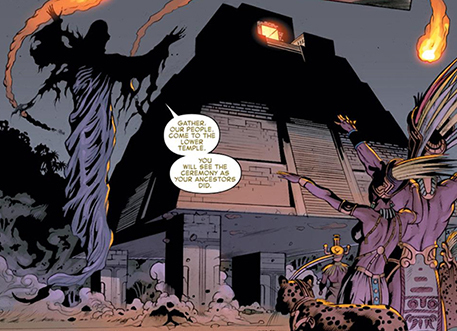 (Hulk III#53) - <9th century> First stage of Temple of Kukulkan (also called El Castillo) built. (Hulk III#56 (fb) ) - Over 1000 years ago, an unidentified group of Mayans were exiled to poor hunting lands by other Mayans. 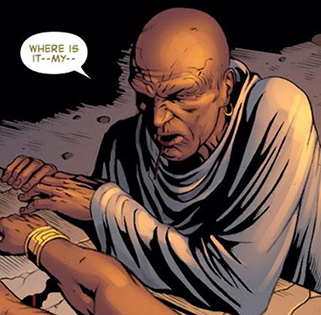 They found an isolated mountain spring containing Terrigen; when exposed to it, many of the exiled Mayans died, but others (with Inhuman ancestry) lay comatose. When they awoke, they could communicate with each other telepathically. They returned to their former lands and conquered the other Maya group. 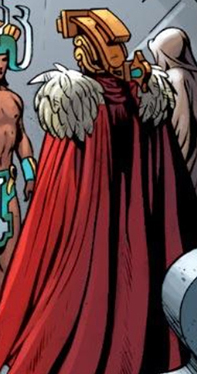 (Hulk III#56 - BTS) - One of the first Mayapan took the name Kukulcan, after the Ahau deity. (Hulk III#56 (fb) ) - They were apparently unable to breed with outsiders, but the second generation of Inhuman Maya, including the weather-controlling "Jaguar Goddess" Ixchel, gained low-level mind control. They could see another spectrum of energy, called "Life Force," created when a life is taken. (Hulk III#56 (fb) ) - The third generation gained the ability to absorb this life force; they learned that certain patterns of jade crystal helped attract the energy. (Hulk III#56 (fb)) - The fourth generation found the key to immortality. (Hulk III#55) - Disguised as monkeys, the twins tricked the Mayapan, luring them into the Crystal of No Escape. The two monkeys "slept" in El Castillo for over a thousand years, but were ready to protect the world as Huracan instructed. (Hulk III#53) - In recent years the Mexican government restricted access to the El Castillo pyramid. (Hulk III#53 (fb) ) - Despite being trapped in crystal, Ixchel sent an illusion of herself as a woman called "Chibi" to lure A-Bomb (Rick Jones) to the crystal prison. A-Bomb investigated the crystal underground with She-Hulk (Jennifer Walters) and She-Hulk (Lyra), but the Mayapan caused him to hallucinate and attack the She-Hulks; in the fight, he accidentally freed some Mayapan. (Hulk III#53) - A week later, Rick Jones (in his human form) joined a tour group to the "Inner Temple" of the Temple of Kukulkan at Chichen Itza while the She-Hulks investigated on the surface. The tour guide, secretly a Mayapan priest, bled on a sacrificial chac mool statue to release Ixchel, who subsequently drained most of the tourists present, including a man named Ray and his wife. The priest declared, "There are more Riders yet left before our Thirteenth Katun begins" (see comments). 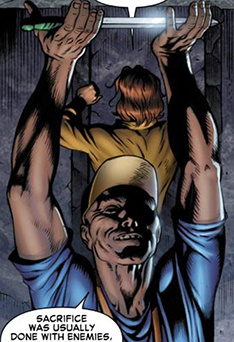 Jones was unable to save a man named Richard, but after transforming to A-Bomb, saved Richard's wife and son. The Mayapan then teleported their pyramid to Canada, taking the She-Hulks with them. (Hulk III#57) - The twins, still disguised as monkeys, fled when they realized Rick was freeing Ixchel. (Hulk III#54 - BTS) - Ixchel and the priest resurrected two more Mayapan, using "Life Force" from the She-Hulks. (Hulk III#53) - Another week later, Jones, now working with Red Hulk (Thaddeus Ross), Machine Man (Aaron Stack), an LMD named Annie, and Alpha Flight (Shaman, Snowbird, Guardian, Sasquatch, Aurora, Marrina, Puck), traced the pyramid's location to Banff National Park, Alberta, Canada. A Mayapan member possessed Sasquatch and was afraid of the ancient forces Shaman could command. (Hulk III#54) - The Mayapan captured several "northern gods" (Alpha Flight members), released the unconscious, withered She-Hulks, then returned their pyramid to Mexico before resurrecting more Mayapan and beginning a reign of terror throughout Latin America. In San Miguel, El Salvador, Ixchel caused floods and quakes before demanding the people worship her. 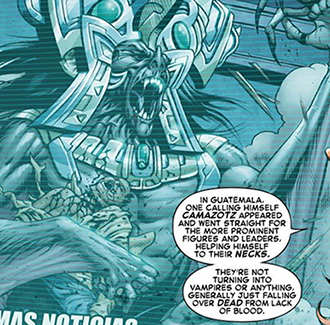 In Guatemala City, Guatemala, Camazotz publically drained blood from government leaders. For unrevealed reasons, the Mayapan sent their Uxmal pyramid to Western Egypt, and when Ross fired a missile at the Chichen Itza temple, it was transported to Egypt where it exploded harmlessly in the desert. 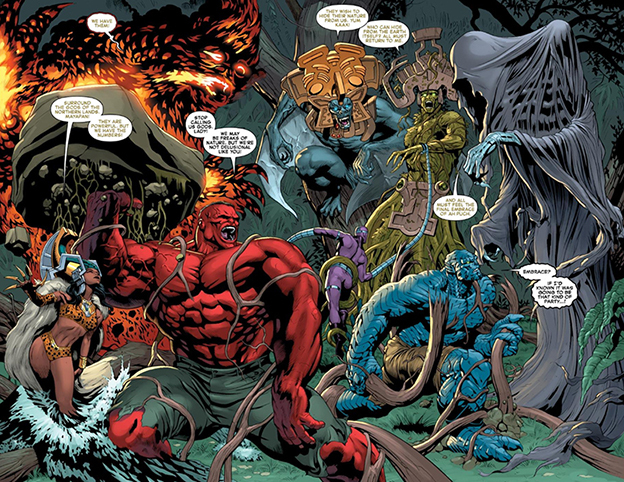 Mayapan members Tohil, Yum Kaax, Camazotz, Ixchel, Ah Puch, and Jacawitz, then attacked Red Hulk and his team, but did not notice Annie enter their temple, nor two monkeys fleeing the scene of battle. (Hulk III#55) - Several "Avengers associates," including Silverclaw (Lupe Santiago), Living Lightning (Miguel Santos), Toro (Benito Serrano), Velocidad (Gabriel Cohuelo), Junta (Manuel Vicente), and other unidentified Latin American heroes, attempted to clean up the damage the Mayapan left in El Salvador, but the Mayapan returned shortly afterwards to capture the local superheroes and use their "Life Force" to restore more Mayapan. They also captured A-Bomb and used his energy to restore Mayapan leader Kukulcan. (Hulk III#55) - Meanwhile, Hunahpu and Xbalanque introduced themselves to Red Hulk and his allies, but fled when they realized Kukulcan had been resurrected. (Hulk III#56) - Kulkulcan quickly defeated Red Hulk and his allies. The Mayapan used Red Hulk's energy to resurrect Ah-Muzencab, but Red Hulk's cosmic radiation killed Ah-Muzencab within seconds of revival. (Hulk III#57) - Xbalanque allied with Machine Man, while Hunahpu gave Red Hulk a jade necklace. 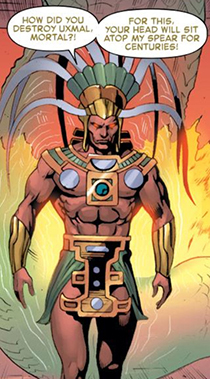 Kukulcan's forces captured and sacrificed Hunahpu, but his energy revived Red Hulk rather than another Mayapan, due to the jade necklace. Shaman used the same jade technology to return "Life Force" to the various superhumans it was stolen from. As superhumans regained their strength and Mayapan members were depowered, the Mayapan were quickly defeated. (Hulk III#57 - BTS) - The Mexican government incarcerated the Mayapan, except for Xbalanque, in a facility designed for superhumans, and the pyramids were restored to their inert states, with Mayapan technology removed or destroyed. Comments: Created by Jeff Parker (writer), Dale Eaglesham (artist). All references to specific "gods" in this profile refer to the Mayapan impersonators, not the original Ahau, unless otherwise noted. The Ahau existed before the Mayapan were created, and were active before A-Bomb accidentally woke them up, including Ahau versions of Kukulcan, Camazotz, Ixchel, and Ahpuch. When this story appeared, there were only a few known Inhuman groups on Earth, since then several more have appeared. 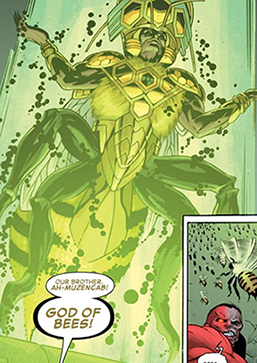 Just as the avian Bird People have adapted their Terrigen abilities to have common winged mutations, the Mayapan share many of the same telepathic and energy-manipulation abilities. 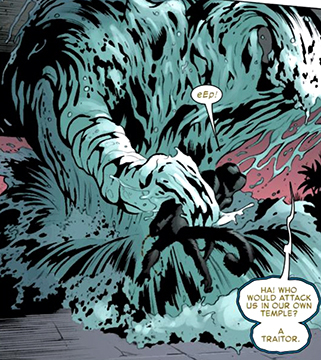 Additionally, unlike the Mayapan, most Inhumans are unable to transform between powered and unpowered states (Devlor of Fantastic Force being a significant exception). It is unclear whether Mayapan are unable to breed with non-Inhuman people at all, or if their offspring did not always have the Inhuman gene needed to undergo Terrigenesis. 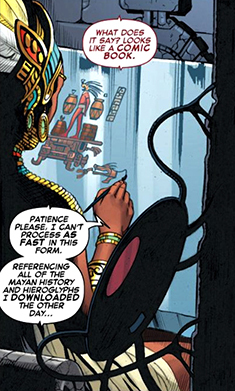 Although their origin story suggested each subsequent generation gained new powers, it is apparent from the first generation Kukulcan and the second generation Ixchel that earlier generations gained the same abilities eventually. It is also unclear whether the predecessors the fifth generation killed referred to earlier generations of Mayapan, or the non-Inhuman Mayans who exiled them. It is unclear what "Life Force" or "Lifewave" refer to. This may be an otherwise unknown type of mystical energy or another name for a known form of energy (similar to the ley lines referenced by other sorcerers). It is also unclear where or how the Mayapan developed their advanced jade-based technology. Xbalanque and Hunahpu claim to work for "Huracan," but it is not clarified who Huracan is. Presumably, this is the actual Ahau god Huracan, one of the most important Mayan creator deities, and not another Mayapan imposter. This story was created to coincide with the "2012 Apocalypse" (see the Wayeb entry for more information), but the dating is topical as the priest god declared it was the start of a new "Katun," he could have meant it as "a new age." A k'atun lasts about 19 years, whereas a b'aktun lasts about almost 400 years. The 13th b'aktun began on December 21, 2012. Gamma Base changed location several times during this story, but that is not relevant to the Mayapan. See the profiles for the real Kukulcan and Ahpcuh. Ah-Muzencab was revived with "Life Force" stolen from Red Hulk, but the cosmic energy proved fatal, killing Ah-Muzencab almost instantly. Impersonating the Ahau god Ahpuch, the Mayapan Inhuman Ah Puch claims to be a death god, and has the ability to kill or decay with a touch, but doing so does not provide the "Life Force" Mayapan use as a power source. He was revived with Snowbird's energy, and he reverted to a powerless state when her energy was returned. 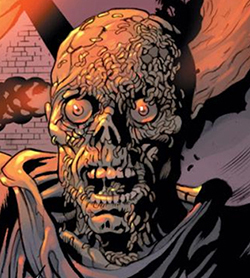 Ah Puch appears as a hooded figure over 20 feet tall, and unmasked appears to be rotting and crawling with maggots. Impersonating the Ahau god Camazotz, the Mayapan Inhuman Camazotz drinks blood and flies on leathery wings. He drained politicians in Guatamala City before rejoining his fellow Mayapan in Chichen Itza. 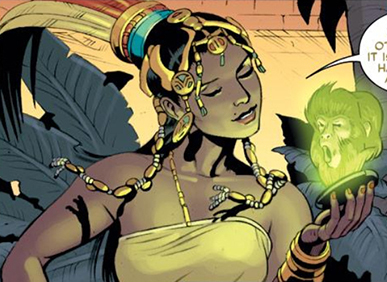 Impersonating the Ahau goddess Ixchel, the Mayapan Inhuman Ixchel was instrumental in releasing the Mayapan from their crystal prison, as she tricked A-Bomb (Rick Jones) into releasing a Mayapan priest while in the guise of "Chibi." It is unrevealed how Ixchel affected A-Bomb while she was imprisoned, or how "Chibi" appeared. She was revived with the "Life Force" of several humans. While most of the Mayapan had their stolen energies returned to their superhuman victims, all of Ixchel's victims are deceased, so her current status is unclear. As other Mayapan, she was taken into Mexican government custody. 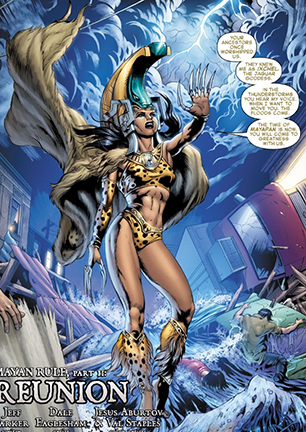 Ixchel can take on animal characteristics, including clawed fingers, and can control the weather, creating large floods. She often carries live snakes with her. 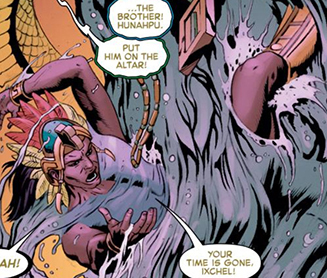 Comments: The Ahau goddess Ixchel was also impersonated by the Inhuman Crystal. Brother of Tohil, Jacawitz was revived with some of Sasquatch's "Life Force." 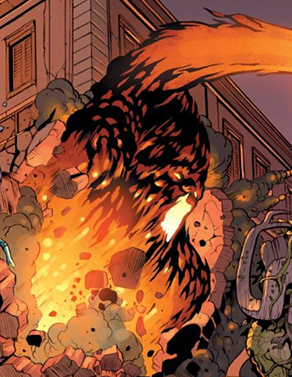 Jacawitz can control lava and is apparently more powerful than his brother, often appearing as a lava being dozens of feet tall. Impersonating the Ahau god Gucumatz/Kukulkán, the Mayapan Inhuman Kukulcan was one of the first Mayapan to gain powers, and is feared by all other Mayapan. He was revived with A-Bomb's "Life Force." 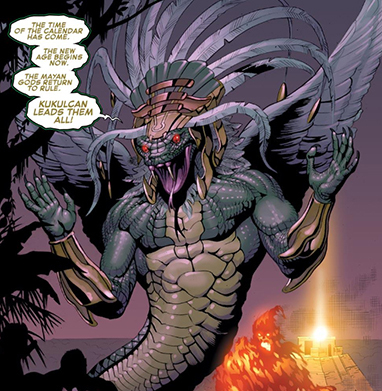 Kukulcan appears as a large snake-man with feathered wings. His name translates to "feathered serpent." Brother of Jacawitz, Tohil often appears as a human-shaped mass of flame and smoke. Unlike other Mayapan, the twins are not impersonating Ahau gods, but are named for them. 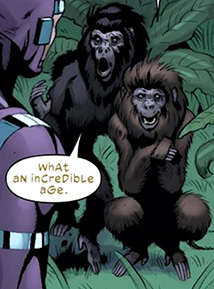 Their Ahau counterparts are both male, and did not transform into monkeys (although the original hero twins' brothers, Hun Batz and Hun Choen, were transformed into monkey gods). The Mayapan Xbalanque and Hunahpu had more empathy than other Mayapan, and followed the god Huracan's instructions in building the crystal prison. They tricked the other Mayapan into the prison, then spent centuries guarding the site. 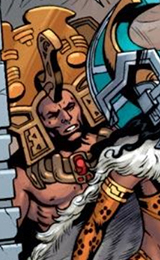 When the Mayapan returned in recent years, Xbalanque formed an alliance with Red Hulk and his team to take down the other Mayapan, and Hunahpu allowed himself to die to ensure the Mayapan's defeat. While the other Mayapan were taken into Mexican custody, Xbalanque remained free. The twins are shapeshifters, often appearing as howler monkeys, with Xbalanque having light brown fur, and Hunahpu having black fur. Comments: Throughout the story, the spelling of the Mayapan Xbalanque and Hunahpu varies, with alternate spellings including X'balanque and Hunapu. Their namesakes, the mythical Xbalanque and Hunahpu, are the Hero twins of the Maya, featured prominently in the Popol Voh book. 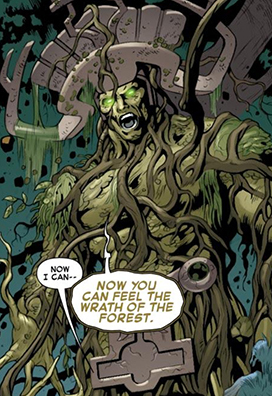 Yum Kaax is plant-like, able to grow and adapted his wood-like body to suit his needs. This unidentified priest god was apparently the first Mayapan released from the crystal prison by A-Bomb. This unidentified archivist goddess recorded the Mayapan history on a codex. She did not detect Machine Man observing her because, as an artificial being, he did not possess "Life Force." This unidentified water god captured Hunahpu when the latter snuck into the inner temple of Chichen Itza.